Early in the 19th century King Shaka transformed his hardly significant Nguni clan into a proud and powerful nation. Born the illegitimate son of King Senzangakhona of the Zulu community and Nandi of the Langeni community and rejected by Senzangakhona, Nandi and Shaka sought refuge with a paternal uncle living with the Mtetwa people, who were ruled by Dingiswayo. Shaka gained valuable experience whilst undergoing military training in Dingiswayo’s iziCwe Regiment. He developed innovative skills in warfare and introduced the iklwa stabbing spear to the armoury. On the death of Senzangakhona, Dingiswayo supported Shaka’s claim to the throne. Shaka assassinated his half brother and assumed leadership of the Zulu. When the Ndwande under Zwide defeated and killed Dingiswayo, Shaka absorbed the leaderless tribe into the Zulu. Zwide then attacked the Zulu but under Shaka’s brilliant leadership at the Battle of Gqokli Hill in April 1818 the Zulu army defeated a numerically superior Ndwandwe force and ended their threat to the Zulu nation. After the superiority of the Zulu Nation had been entrenched under Shaka’s leadership, they extended their power base to cover all of what is now KwaZulu-Natal 1n 1828, Shaka was assassinated by his half-brothers Dingane and Mhlangana and he was succeeded by Dingane. Dingane saw the increasing influence of the whites in Port Natal as a threat, exacerbated by the arrival of the Voortrekkers over the Drakensberg range of mountains. The stage was set for more conflict. The role played by Shaka still inspires pride among the Zulu people. During his twelve year reign he built and led a powerful army, while setting new cultural standards for his people. Historians acknowledge his military leadership and prowess in developing new weapons and tactics such as the short stabbing spear and the battlefield strategy izimpondo zankomo or “horns of the beast” encircling tactic. Despite understandably subjective Victorian criticism, contemporary accounts from shipwrecked sailors in the 18th century and early hunters and adventurers describe the Zulus with whom they came in contact as cheerful, prosperous and law-abiding people. For more information about each site see Early Zulu Battles and Historical Sites. 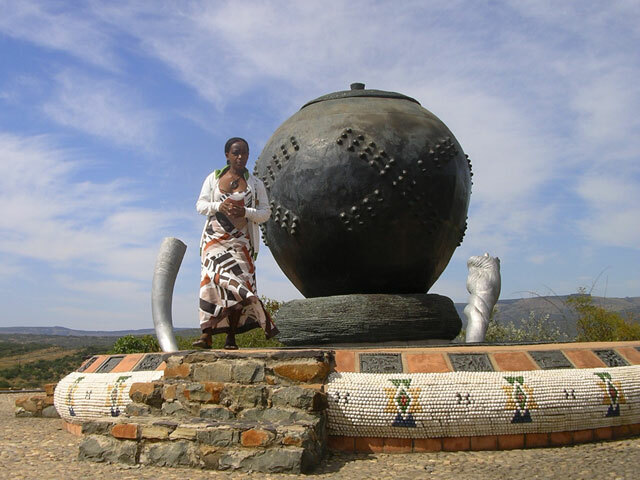 Inset: The Spirit of eMakhosini overlooks the Valley of the Kings where many Zulu kings are believed to be buried.